Small - $66.99 Medium - $66.99 X-Large - $66.99 Only 1 left! You know, before we saw The Incredibles, we always just assumed that superheroes just made their own costumes. We figured that they spent hours hand stitching spandex and more hours screen-printing logos on the front. Boy, were we ever wrong! It turns out that superheroes get their outfits from renowned stylists, just like celebrities and supermodels. Even the models in Milan marvel at the incredible styles worn by supers. We should’ve known that though. Did you see Mr. Incredible and Elastigirl’s costumes? Those things are seriously, on point. To die for, darling! So, it’s no surprise that Edna Mode is now our idol. She’s got the style sense and the vision to design for supers. She has the know-how to create a suit that can even contain Jack-Jack’s bonkers bananas powers. Now that’s really something, isn’t it darling? Do you long to design the outfits of supers? Then it’s time for you to become Edna Mode. This grand costume is based on her appearance in The Incredibles 2 and it’s just as scene-stealing as Edna is in the movie! 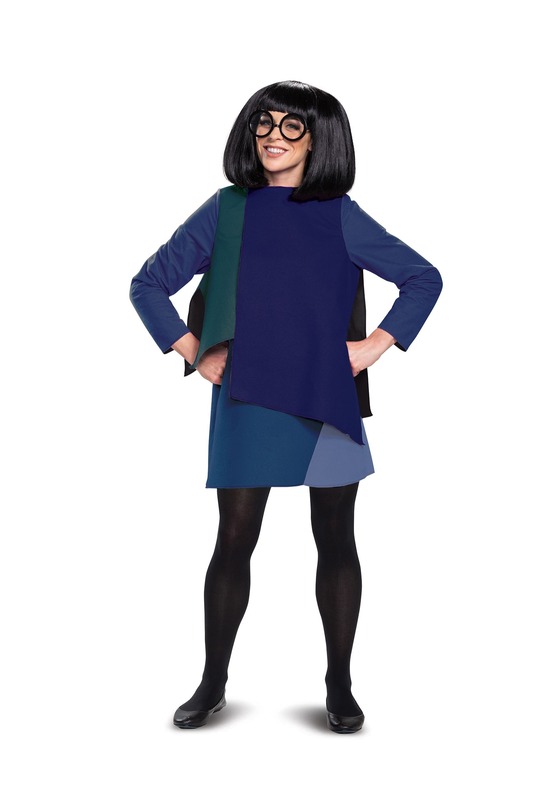 The costume comes with a blue tunic that’s designed to look just like the one worn by her. It has various sections to give it a 50s modern style. It even comes with a wig to give you that Japanese Bob hairstyle. To finish the costume off, a pair of round glasses are included to add a delightfully smart flair! Once you have this costume, you may just find yourself struck with inspiration. You might even feel the urge to design a whole new series of super costumes for Mr. Incredible, Elastigirl, Dash, and Violet! Of course, if you’re looking for a great addition to your Incredibles 2 group costume, then this is exactly what you want, darling.